A good few people had told us that Paraguay was a pretty hairy place and to watch out so we decided to bring nothing except for our passports, some cash, an emergency credit card and a camera with us. We hopped on an international (but curiously local) bus for the 15 minute drive across the river Paraná and into Encarnacion, Paraguay. We got off the bus twice to do our border duties, once on the Argentine side to leave and again on the other side to enter Paraguay. First impressions very good, the Paraguayan immigration officer was looking all over my passport for something, i thought he was checking for flaws or signs of fraud but then he asked me where the harp was – he wanted to see a harp (my passport harp has sadly rubbed off). Back on the bus again and on into Paraguay – the difference was immediately notable – street sellers everywhere, roads and houses in bad condition and a general feeling (but not at all unpleasant) that had much more in common with Peru and Bolivia rather than Argentina. We hopped off the bus and wandered around for a while, checking out the plaza de armas (even the square was called plaza de armas again like in Peru) before going to a restaurant that the SA handbook had recommended: Rubi Chinese. When in Paraguay, go for a Chinese – why not! It was fabulous, full of tasty vegetables and ridiculously cheap at about £6 for both of us to have a feast. Energised we were ready for the markets and for our search for a thermos flask, and a few other ancillary shopping objectives we had set ourselves over lunch – a pair of jeans which I should have brought with me in the first place and some thick thread with which to repair my bag which had been sliced open in La Paz. Paraguay, I believe, and Encarnacion (I know) is one big market. Mom, you would love it. Dad it's your worst nightmare. Its different from La Paz in that most of the goods are manufactured rather than agricultural ... it's a bit like being in a pound shop the size of a small town. The closest thing (but not even that close) that I can relate to it is Tati in Montmartre, Paris, a huge collection of connected shops with characteristic pink bags filled with cheap tat. We started looking for unbreakable metal thermoses – at one end of the street we saw then for 38000 Guaranies (about US$7.50) and by the time we got to the river end they were down to 25000. Score! They cost US$25 in Argentina! On to the jeans – we went into a warehouse with 1000s of jeans and i started to try on some I liked. Something very wrong with either the sizes or my weight was spiralling out of control.. “Claire can you bring me in a 38 waist please” (!!). She duly did, which fit a bit better but felt a bit ... funny. They were girls' jeans. We left the shop and found a different emporium where the gents 32” fit just fine. There are a lot of electronic appliance shops in Encarnacion too – laptops, flatscreens, cameras, MP3 players – you name it. Out of curiosity I inquired after some of the prices – were they duty free? Well the aussie girls from the salt flats had shown me a tiny little laptop they were using and i had complete tech envy – they had bought it in Singapore for US$350 and I had been harbouring a desire to emulate them. They had them here!! US$300! I couldn't possible go shopping for a thermos flask in Paraguay and end up with a laptop could I? I made lots of enquiries about how customs work. Clearly the target market is Argentenians and Brasilians but i needed some sort of reassurance that I wouldnt have to pay or bribe some customs official another $300. So I started asking around ... some guys would send it over the border for you for 30 or 50 bucks. No thanks – very dodgy I'd end up minus the cash and with no laptop back in Argentina. 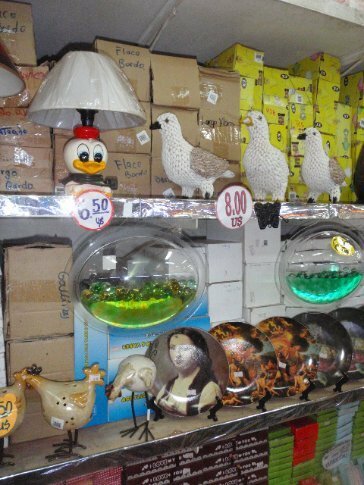 So we decided to forget the potential impulse purchase and go back to laughing at the bewildering array of plastic buddhas, gaudy water features, life size pigeons made of seashells and bulk buy condoms on offer. It was nearly 5pm and we had decided to head on back when I asked the price of the mini laptop and asked how it all works one more time, just to see if I could make sense of it all – I mean all these shops had to sell to people and people must be able to get them back somehow. This chap made some sense. You have a $150 allowance for electrical items, beyond which you have to pay 25% of the value of the item as duty. As there were 2 of us, we had a collective $300 and so would not have to pay the duty on it. And if there was a problem you could always bribe the official. This not being my style I insisted on reassurances and he was pretty convincing. We had a mini conference (in the style of Dragons Den once a definitive offer is made) and decided to go for it. Over the course of a year what we would save in internet cafes typing this blog (which takes about 2 hours per entry) would justify it. Out with the emergency card and on with the show. An extra 10% to pay buy by card goddamit. OK lets just do it and get outta here! We got back on the bus and reversed the immigration process, having about a 30 minute wait after exiting Paraguay and before re-entering Argentina, so technically we were nowhere, on a bridge over a river between 2 countries. Along came the bus and we got our entry stamps (which were now starting to build up!) and went to Argentinian customs. Not knowing how to go about smuggling or bribery I went about things in a strictly un-South American way – I walked up and declared the goods. This caused a bit of a hulla-balloo (not many punters choosing this option) and we were moved into different rooms and various people came along and mentioned payments and other scary things until the guy who was clearly the decision maker graced us with his presence. He hummed and hawed and examined the laptop, looked at the specs, poked and prodded before asking what in hindsight was quite an obvious question – “Are you married?” That was it I thought – we're going to literally have to pay for this. I pleaded genuine ignorance about the stipulation to be married to allow joining of allowances. He looked me in the eye, I looked back and Claire smiled sweetly not knowing exactly what was going on. I told him we were going around the world and this was to stay in touch with home. He took out his official looking stamp and bade us a good journey. Woo Hoo! we made it, laptop intact and for no additional fee. Colm and Ciaran, FYI its a Linux Asus Eee PC 4GB HD, 512 RAM, and I have to say it's brilliant. In fact I am writing this standing up outside the toilet on a packed bus to Iguazu falls. No more will I have to spend 3 hours at a time in a cafe writing the blog on my tod. I can do it when I like. Also, as it has a webcam and mike we will be able to MSN, skype and google video mail – if anyone signs up please let me know your details so we can set it up. So, enough about that ... we got back to the hotel, packed up and prepared to move on to the next destination, only one hour from Posadas – San Ignacio Mini.